In my last post on Henry Hathaway, I wrote about Down to the Sea in Ships (1949). For this one, I’m going pretty much from the sublime to the ridiculous. There is much that is ridiculous about Prince Valiant (1954), but it’s also ridiculously good fun — and not only for wiseacres out for a campy laugh. Wagner said that mainly, it was the wig (in fact, that’s the title of the chapter in which he discusses it), and as you can see from the picture above, he has a point. 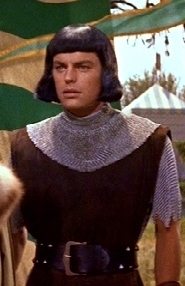 Pauline Kael once said that no actor can triumph over a bad toupee; she was talking about Walter Matthau in The Laughing Policeman, but she might well have been thinking of Robert Wagner in Prince Valiant. Wagner claims that Dean Martin visited the set one day and spent ten minutes talking to him before he realized he wasn’t Jane Wyman. Wagner himself thought the wig made him look like Louise Brooks; to me he looks more like Archie’s girlfriend Veronica. In any case, the wig is a performance-killer, no error. I doubt if Richard Burton — another young actor under contract to 20th Century Fox at the time, and one who might have made a good Valiant himself — could have made it work. It must be said that in every case, that somebody should have been Henry Hathaway. Wagner’s rise at 20th Century Fox hadn’t exactly been meteoric, but it had been pretty swift: eleven pictures in just over three years. He was earnest and hardworking, but not a natural for a role like this; he had neither the effortless panache of Errol Flynn nor the graceful aplomb of Tyrone Power. He was certainly nowhere near the seasoned performer he would become in time (and remains today). But you can’t say he wasn’t game; thrust by Darryl F. Zanuck into the title role of a comic strip he’d loved as a kid, he dove into it with all the relish his then-limited resources could command. It was a mercy (to him then, to us now) that he didn’t overhear the wisecracks of the crew until his work on the picture was done, so his enthusiasm at least remains high on screen and never flags. An actor, when he’s lucky, gets his in-over-his-head performances out of the way in high school, college or amateur theater, then leaves them behind. It’s Wagner’s bad luck that he had to stumble like this in full view of the world. In CinemaScope and Technicolor. 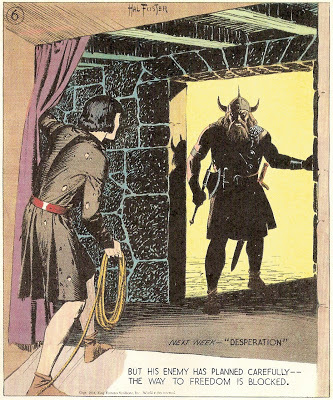 So let us stipulate that Prince Valiant is mushy at the center, and grant that it’s not easy to watch without wincing in sympathy for a young hero who seems to be floundering in Daddy’s oversize suit of chain mail. The picture still has its pleasures, especially for those who discover it in uncritical childhood — the age at which a couple of generations of kids discovered Harold Foster’s comic strip. …with this view from the movie. 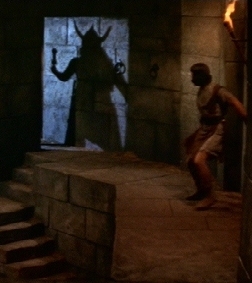 That’s Sir Gawain and Val again in the foreground (though the plot differs from Foster’s), and the image is courtesy of Hathaway, cinematographers Lucien Ballard and Charles G. Clarke, art directors Lyle Wheeler and Mark-Lee Kirk, and special effects ace Ray Kellogg. And here’s a comparison I particularly like. On the left the strip, on the right the movie. As with the examples above, the context of the shot in Dudley Nichols’ script differs completely from what Foster wrote in the strip, yet it’s clear to see that Foster’s dramatic design and pictorial sense were carefully studied and, wherever possible, emulated in the movie. …and let the stunt men (David Sharpe and Buddy Van Horn, among others) deal with them. 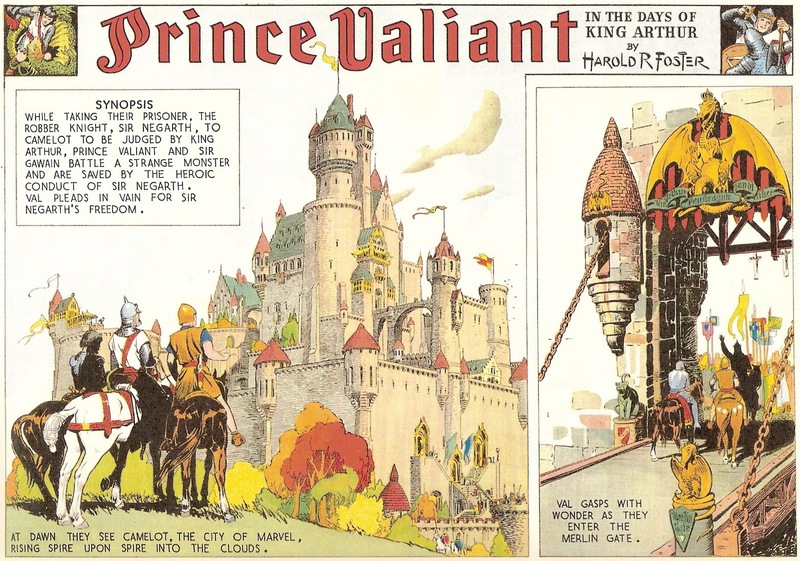 …and Franz Waxman’s virile, heroic score (one of his best) coming in at exactly the right moment, as Prince Valiant’s magical Singing Sword takes up its song on the side of right and honor. It’s 2 minutes 52 seconds from the first stroke until the villain falls dead, and it’s one of the most exhilarating swordfights ever committed to film. 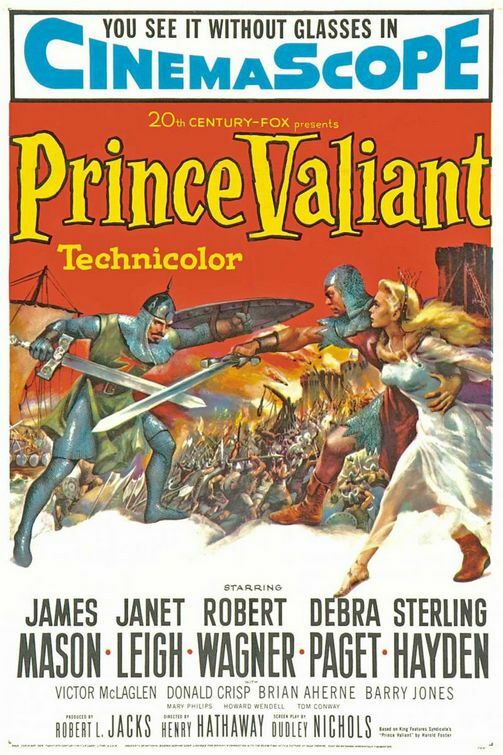 Reviews for Prince Valiant weren’t particularly generous, but the reviews and Robert Wagner’s wig notwithstanding, the picture did well at the box office. (Wagner, for his part, counted his blessings and resolved never to get stuck in a role like that again.) Of the movies I’ve covered so far in my retrospective posts on Henry Hathaway, this is admittedly the least of them. It’s not historically important like The Trail of the Lonesome Pine, nor a neglected masterpiece like Down to the Sea in Ships, but it’s unpretentious fun in a Boy’s Own Adventure way. Harold Foster’s strip was 16 years old when the picture went into production (it still runs every Sunday in about 300 papers, 74 years after Foster, who died in 1982, created it), so the first generation of Valiant’s fans had kids of their own to take to see the movie. Dudley Nichols’ script jettisons the episodic plot of the strip (which most of its fans wouldn’t remember anyway, having few reprints to refer to) in favor of a simple story incorporating visual and dramatic elements that the fans would remember and respond to. At the midway point there’s a lavish recreation of a jousting tournament in the Age of Chivalry, with some fine equestrian stunt work. And capping it all off is a rousing final half-hour that redeems much of what has gone before. “It was a magnificent film — the scenery, the castles, everything was beautiful. They used all my research: Sir Gawain had the right emblem on his shield, everything was right. But somehow, the story was a little bit childish…it was Hollywood. Jim: I just discovered your wonderful site. Love this post and consider me one of those who first saw this film as an uncritical child and I still love to this day at my ripe old age of 48. It's one of my all time favorites, and boy do I get a lot of grief for that. But I think its one of the best comic strip (or book) movies ever made, even recognizing its flaws. I rather like Wagner as the callow youth. I find him easier to take than Sterling Hayden as an English knight. He looks like he'd much rather be doing a western. Mason is great in it, and Janet Leigh and Debra Paget are two of the loveliest ladies in medieval filmdom. The Franz Waxman score is a marvel, one of his very best. A few years ago the Chicago Symphony Orchestra performed an evening of film music and they performed a short suite from the score. When that famous CSO brass section tore into the main title music I literally got goose bumps. It was thrilling beyond belief. I liked your write-up about the castle siege and the final duel. That sword fight is one of the very best ever staged and I liked how Waxman's score adds another dimension to the scene. 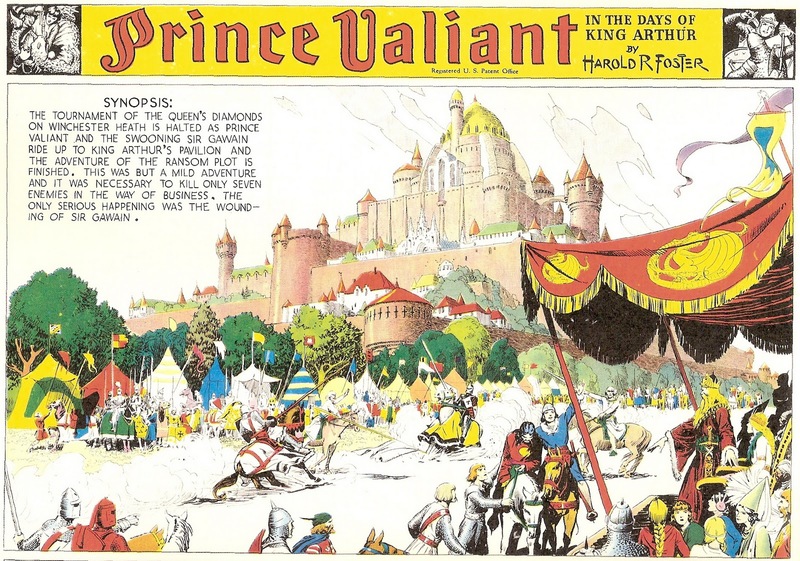 The first half of the duel is performed with no music, but towards the end when Valiant picks up his father's sword – the Singing Sword – the music kicks in, not in triumphant fashion, but with an eerie, somewhat ethereal treatment of the Prince Valiant motif. It's as if the music is telling us it's here that Valiant is leaving boyhood behind and has become a man. Hathaway's camera compositions can't be beat either. I do have some problems with the DVD transfer. It's quite inconsistent in its colors and I would love to see it restored someday to its full Technicolor glory. Probably will never happen, but I can dream. I'm going to look forward to reading some of your other Henry Hathaway posts. Sorry for rambling so long, but I adore this movie. Welcome, Kevin! I know what you mean about that grief; last year at Cinevent in Columbus I had to bite my tongue when a friend dismissed PV as "a terrible movie." I didn't want to get in any fights; maybe he'll read this post and consider it my answer to him. I still kinda wish Richard Burton had played Valiant, but I see your point about Sterling Hayden. Let's say I wish Burton had played Valiant and Stewart Granger had played Sir Gawain. I see your point, too, about the DVD: I suspect the transfer was not made from Technicolor source material. However, I'm grateful to have the CinemaScope aspect ratio restored (Hathaway adapted to the wide screen far better than most of his veteran colleagues). Finally, my congratulations on your own blog, Kevin's Movie Corner — beautifully set up, perceptive and well-written, and nicely illustrated. I encourage my readers to check it out. Just stumbled onto this site myself (Thank you, Greenbriar Picture Shows). As a great fan of the strip, I still enjoy the movie for what it is: a playful (but never tongue-in-cheek) Hollywood swashbuckler. It's easy to pick on Wagner and Hayden, but the whole movie is overrun with obvious American accents (I particularly recall a Viking who reports to the Black Knight early on). True, they played fast and loose with Foster's mythology (Note that the movie trailer identifies Leigh as "Aleta, Queen of the Misty Isles" when the film itself demotes Aleta to local nobility). 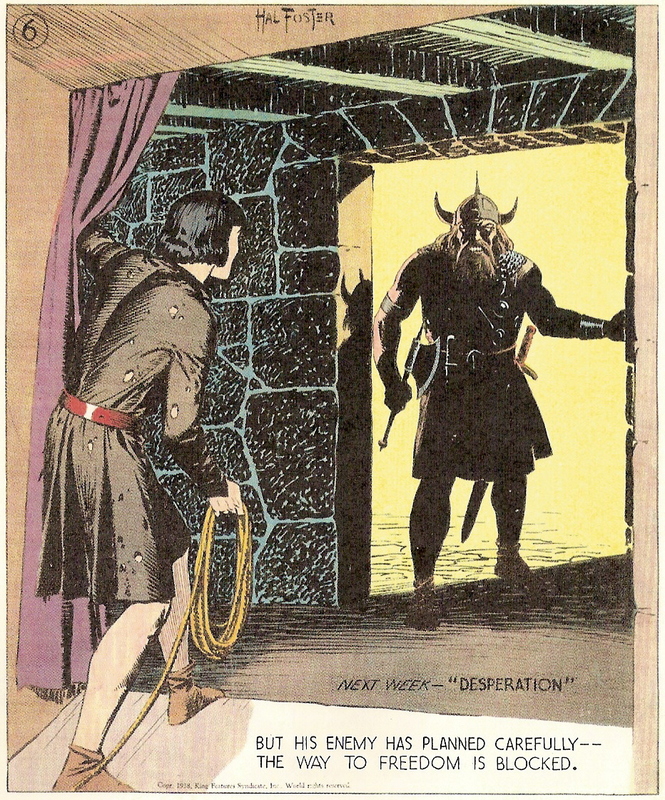 But there's at least one action scene that comes straight from the comic page: In the big Viking battle, Val lures a pursuer out on a ledge while holding the end of a rope. Val leaps, and the rope sends the pursuer falling. You're absolutely right about that luring-the-pursuer-onto-the-ledge moment in the movie, taken from the February 6, 1938 installment of the strip. I considered including that among my strip-to-movie comparisons, but decided I already had enough to make my point.